A tech-company executive once told us how much he hated his email. From our conversations with hundreds of CEOs and executives over the years, we can tell you he’s not alone. Many have come to loathe the constant influx of email to their inbox. You need to get good at writing emails. It starts with identifying the red flags🚩 that mark your email as poor in the eyes of your recipients. You don’t need an English degree to write a good email, but you should know the basics. Mignon Fogarty’s book Grammar Girl’s Quick and Dirty Tips for Better Writing is one of the best resources for easy-to-understand writing tips. If you use Gmail or another web-based email client, the free Grammarly Chrome extension can also help tremendously. Want people to pay closer attention to your emails? Write shorter emails, and press the “return” key more often to break up a solid block of text. For example, here’s an email someone once wrote to Steve Jobs complaining about a problem with his or her MacBook. Steve’s response, by contract, is much shorter. Emails need a “call-to-action”. Why did you send the email in the first place? What do you want the person to do? Whatever the next steps are, state your recommendations explicitly. If you use templates, at least make sure to personalize them so they don’t look like templates. Here‘s a free resource that you can customize. Finally, if you really want to get the attention of your recipient, do something to make your email stand out. If you’re a salesperson, for example, you need to catch your prospect’s attention with something different—something that sets your email apart from the many other sales emails your prospect is likely to receive that day. One extremely easy way to stand out is to send a quick video embedded in your email—one you create uniquely for the person who will receive your message. That will instantly let your prospect know that you did your homework and that you took the time to create a message for them, specifically. It’s easier than you might think to create a personalized video. You can create and send a video with one click—without leaving Gmail using our new Video Email Chrome extension. Whatever you do, make it easy for the person reading your emails to say “yes” to whatever request you make of them. Keep your emails short and to the point. Be explicit about the next steps. And personalize them so they don’t look generic. And finally, if you’ll be asking for a calendar appointment in your email, don’t forget to use Meeting Scheduler, another free tool from the cloudHQ productivity library. Meeting Scheduler lets other people pick a time on your calendar that works for them, saving you the back and forth emails about finding a time that works for both of you. Plus, using a calendar link helps you be 87% more likely to book the meeting. Did you know that when you ask someone for a meeting in email, you’re 87% less likely to book it when you’re not using a calendar booking system? It’s shocking, and key for salespeople and similar professionals to be aware of. That’s why we decided to build you a new free tool to help you book those meetings. Announcing the release of Meeting Scheduler for Gmail that works directly within Gmail as you compose your email. It allows you to share your available meeting times with your email recipients. 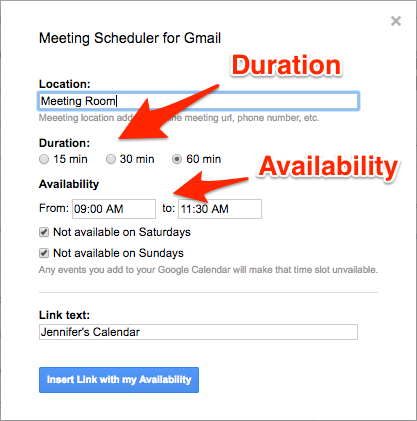 To use Meeting Scheduler for Gmail, start by installing the free Chrome extension. Here’s an example of how Meeting Scheduler can be used in a work setting. Jen starts the process by composing a new email. Meeting Scheduler inserts Jen’s calendar link into her email, and Jen just clicks on “Send”. Samantha clicks the link to Jen’s calendar, and sees the only available meeting time on March 2nd is for 9am. She books it. The meeting is added to Jen and Samantha’s calendars. Both also receive an email confirming the meeting. Meeting Scheduler for Gmail is perfect for all of you who already rely on Gmail and Google Calendar to organize your life. The next time you schedule a meeting, you won’t need to play email tag, and you’re 87% more likely to get your meeting booked.